The Secret Doctrine by H.P. Blavatsky is a double-volume work consisiting of the two books: Cosmogenesis and Antrhopogenesis. They where published in 1888 and Blavatsky claimed that the contents had been revealed to her by ‘mahatmas‘ who had retained knowledge of mankind’s spiritual history, knowledge that it was now possible, in part, to reveal. The first part of the book explained the origin and evolution of the universe itself. The world and everything in it is supposed to alternate between periods of activity (manvantaras) and periods of passivity (pralayas). Each manvantara lasts many millions of years and consists of a number of Yugas, in accordance with Hindu cosmology. 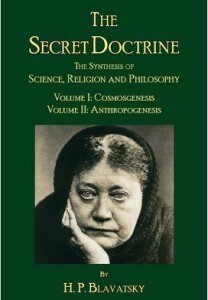 Blavatsky wanted to publish a third and fourth volume of The Secret Doctrine. After Blavatsky’s death, a controversial third volume of The Secret Doctrine was published by Annie Besant. Blavatsky claimed that the contents had been revealed to her by ‘mahatmas‘ who had retained knowledge of mankind’s spiritual history. i love philosophy so this is the book of this edge.